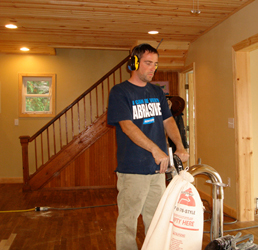 Rob LeGrand of LeGrand Wood Floors is Northern Michigan’s premier wood flooring contractor. Quality is never sacrificed. Pride in partnering with homeowners and general contractors to achieve excellence in every floor. With over 20 years as a woodworker, Rob services wood flooring needs for new construction, remodeling and restoration. LeGrand Wood Floors serves Northern Michigan for all your wood flooring needs. From straightforward, simple refinishes to borders and medallions, LeGrand Wood Floors is your reliable Northern Michigan floor contractor. Visit the showcase of floor galleries for new construction, refinished floors, and featured projects. If you are looking for specific wood species or stain examples you don't see in the galleries, please contact LeGrand Wood Floors, most likely we have something to show you.